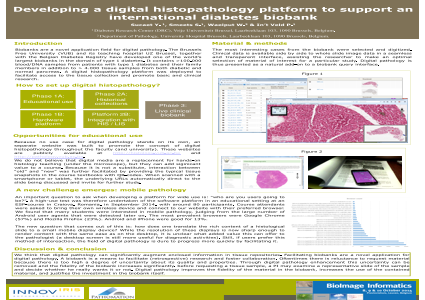 Abstract: Biobanks are a novel application field for digital pathology. The Brussels Free University (VUB) and its teaching hospital UZ Brussel, together with the Belgian Diabetes Registry have developed one of the world’s largest biobanks in the domain of type 1 diabetes. It contains >100.000 blood/DNA samples from patients with type 1 diabetes and their family members in addition to > 4.000 tissue samples from both diabetic and normal pancreas. A digital histopathology platform was deployed to facilitate access to the tissue collection and promote basic and clinical research.